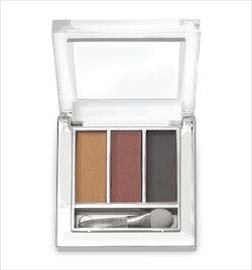 Three-piece eye shadow kits with complementary colors packaged in one convenient kit. These color combos have been specially coordinated by some of SACHA’s expert Makeup Artists. As with all SACHA eye shadows, the color you see in the container is the color you get on your skin. From soft, natural, pearlized shades to rich, vibrant and matte shades, these trios have excellent staying power and look “just applied” for several hours. Talc, Zinc Stearate, Calcium Carbonate, Isopropyl Palmitate, Isopropyl Isostearate, Octyldodecyl Stearoyl Stearate, Iron Oxides, Mica, Titanium Dioxide, Ultramarines﻿.